Hope someone has an idea for me on this. I am making a “TV Shelf” and would like to use a French cleat to hold. I am making it out of 4×4 doug fir. 17 inches deep and 60 inches long. Do you think a French cleat will hold that weight. I plan to make it out of the 4×4s so it looks seamless on the wall. Open to any other suggestions as well. How much weight? Where on the 17”s will it be placed, inboard or outboard? Not that it makes too much difference. The downward twist at the outer edge will be pulling the shelf inner edge out of the cleat. I hang all my garage cabinets with a french cleat made from 1×6 pine that I cut into two piece at 45 degrees approx 1/3 to 2/3. The wall part of the cleat is the 2/3 part and gets two #10 screws into each stud for the length of the cleat. The cabinet part gets glue and a #12 screw every 6 inches. These cabinets are about 14” front to back and I guarantee each one weighs at least 50+ lbs each. They’ve been up on the wall for 5 or 6 years and are as solid as when I put them up. With that being said, Jack has a good point about loading of the shelf and lever arm length. A shelf that will hold a 65” LED TV sitting centered on the shelf forever might not hold an 10 year old hanging from the edge of the shelf. Though my gut feel is that a well fastened french cleat would provide you with all the strength you need for a TV and some decorative items. Hey Jack, that’s an excellent point about the front of the shelf pulling the back out. I plan on placing the TV toward the wall side on the shelf. Could I bolt/screw the French cleat together? Would that provide enough hold? Thank for the onsite/pick Mike. Makes me feel pretty solid on it being able to support the overall weight. I am making it out of 4×4 doug fir. 17 inches deep and 60 inches long. Do you think a French cleat will hold that weight. 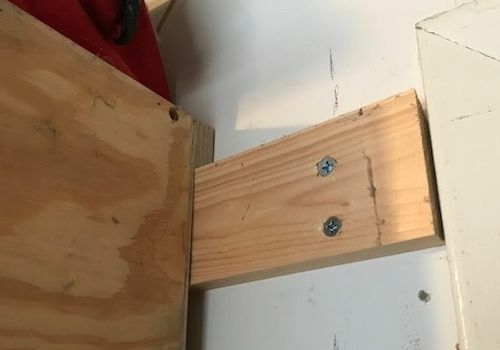 I’m not sure weight would be the problem, as properly tied into the wall studs, they can support quite a bit – But is this shelf going to have vertical supports (from front of the shelf back to the wall)? The design of a French cleat is great for downward force, not lateral. Cabinets work perfect as they have the vertical support against the wall to prevent it from pivoting at the cleat. A shelf doesn’t. A French cleat can be used to attach the shelf to the wall, but it will need some support at the front or it will just rotate downward and dump the tv on the floor. I’m not 100% sure I understand what you are proposing. It sounds like the shelf will be 4” thick and the cleat is meant to be hidden in a pocket in the back. If so, this sounds similar to a fireplace mantel. If you Google “fireplace mantel french cleat” you’ll find many examples. At 4” think it’s not going to rotate assuming it contacts the wall or the pocket contacts the cleat. Though any slop in your fitting and it may want to droop down. But you could just put something to function as a shim near the lower edge to get it level. At 4” thick, assuming the cleat catches 1” from the top, you would have about 3” for rotational support. Assuming the TV weight and the shelf weight are in the middle of the 17” depth (8.5”) whatever force that weight is would be about 3X larger pulling out at the top of the cleat, and pushing in at the bottom edge of the shelf. Say the whole things is 100 lbs. You would have 300 lbs pulling at the top of the cleat, and 300 lbs pushing against the wall at the bottom of the shelf or against the lower edge of the cleat. Of course you would have the cleat fastened to studs and at about 60” long you’d catch 2 to 3 studs. 300 lbs isn’t that much. And of course you would have the 100 lbs pushing downward which is more or less trivial. The large screws like Mike showed would be just fine. Just make sure the cleat is good solid wood so the screws can’t compress it too much, or us lag bolts and washers. That type of thing. There are also ways of making the cleats out of metal, though I don’t think that is necessary. P.S., don’t forget your wall probably isn’t perfectly straight, so be sure to allow for scribing and then shaping the back edge of the shelf to match the wall. I don’t know I understanding either. 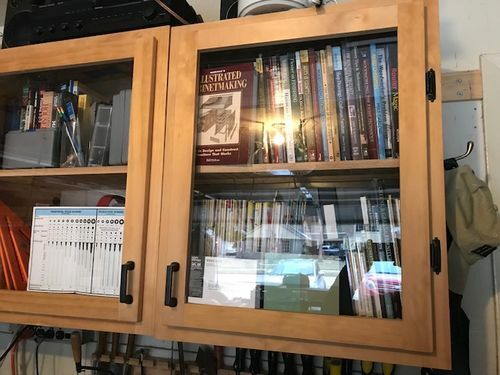 Are you gluing 60 inch long 4×4’s together to make a shelf that is 4 inch thick and 17 deep and 60 inch long? What kind of wall is it? One important thing about French cleats; you can’t put them near German cleats or they will run away. One important thing about French cleats; you can t put them near German cleats or they will run away. In heaven your butler is British, your mechanic is German and your cook is French. In hell, your butler is German, your mechanic is French and your cook is British. Sounds more like you need floating shelf hardware. dumb question, but if you’re mounting a floating shelf on a wall and then putting the tv on the shelf, why not just wall mount the tv? you could still build the floating shelf & put it under the tv if you need a place for cable box, etc., but then you wouldn’t have the weight concerns.